W.C.T.U. met for its November meeting at the home of Mrs C.S. George. Rev. Fowler had charge of devotional reading several selections from the Scriptures followed by an interesting discussion and prayer. Secretary read the minutes of the October Meeting. the report was approved. The Treasurer's Report was read showing a balance on hand Sept. 1, 1932 of $27.93. Disbursements for the year were $175.03. Report was accepted. It was voted to purchase the [cut?] of our white ribbon bow to be used in all publicity work. The sum of 75 cents was allowed for its purchase. Committees were appointed to visit the schools as follows: - Center - Mrs. R.J. Hadley, Mrs. Geo. Lincoln Parker - Mrs. Alder, Mrs Molls Davis - Mrs. C.S. George and a helper she selects. Miss Ada Park gave an interesting report of the State Convention held at Dennison Iowa. 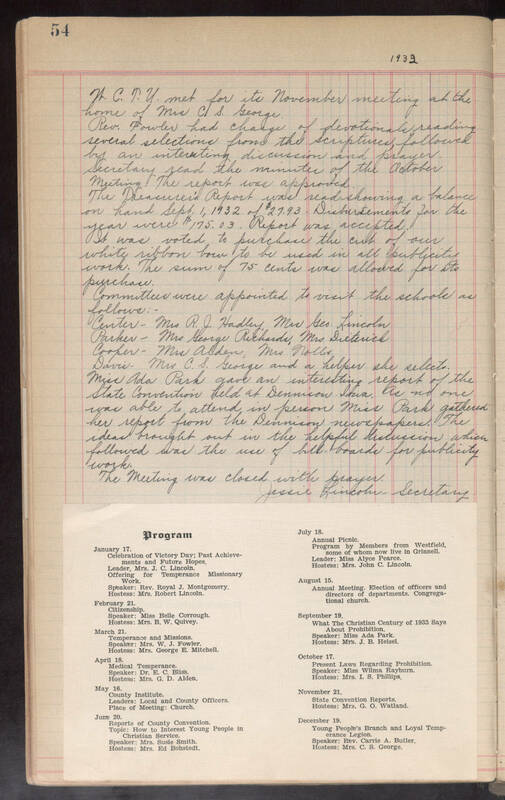 As no one was able to attend in person Miss Park gathered her report from the Dennison newspapers. The idea brought out in the helpful discussion which followed was the use of bull. boards for publicity work. The Meeting was closed with prayer. Jessie Lincoln - Secretary Program January 17. Celebration of Victory Day; past Achievements and Future Hopes. Leader, Mrs. J.C. Lincoln. Offering for Temperance Missionary Work. Speaker: Rev. Royal J. Montgomery. Hostess: Mrs. Robert Lincoln. February 21. Citizenship. Speaker: Miss Belle Corrough Hostess: Mrs. B.W. Quivey March 21. Temperance and Missions. Speaker: Mrs. W.J. Fowler. Hostess: Mrs. George E. Mitchell April 18. Medical Temperance. Speaker: Dr. E.C. Bliss. Hostess: Mrs. G.D. Alden. May 16. County Institute. Leaders: Local and County Officers. Place of Meeting: Church. June 20. Reports of County Convention. Topic: How to Interest Young People in Christian Service. Speaker: Mrs. Susie Smith. Hostess: Mrs. Ed Bohstedt. July 18. Annual Picnic. Program by members from Westfield, some of whom now live in Grinnell. Leader: Miss Alyce Pearce. Hostess: Mrs. John C. Lincoln August 15. Annual Meeting. Election of officers and directors of departments. Congregational church. September 19. What the Christian Century of 1933 Says About Prohibition. Speaker: Miss Ada Park. Hostess: Mrs. J.B. Heisel. October 17. Present Laws Regarding Prohibition Speaker: Miss Wilma Rayburn. Hostess: Mrs. I.S. Phillips. November 21. State Convention Reports. Hostess: Mrs. G.O. Watland. December 19. Young People's Branch and Loyal Temperance Legion. Speaker: Rev. Carrie A. Butler. Hostess: Mrs. C.S. George.